National Museums Northern Ireland curator Dr Mike Simms admires the 1950s children's science set which was once described as the world's most dangerous toy. 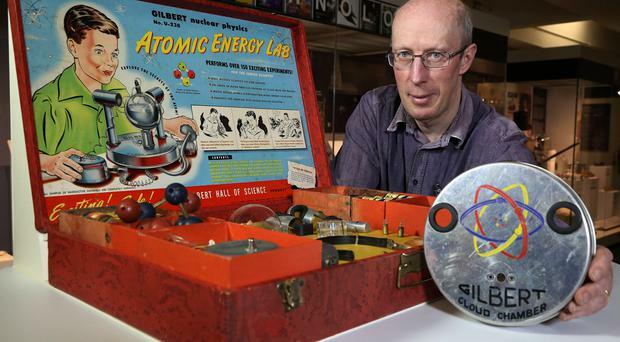 A children's science set which was once described as the world's most dangerous toy has gone on display at the Ulster Museum. The Gilbert Atomic Energy Lab was the most elaborate atomic energy educational set ever produced and retailed for a relatively high price, in 1951/52, of 50 US dollars. Billed as for the junior scientist and performing more than 150 experiments, the set came with four types of uranium ore and three different radiation sources. A Geiger counter could be used to detect how contaminated the young scientist had become. There was a government manual too - Prospecting For Uranium - and even a form for ordering replacement radioactive sources. National Museums Northern Ireland's curator of palaeontology Mike Simms said: "I think visitors will find it amazing and amusing that this set allowed budding young scientists to measure radioactivity of uranium in the comfort of their own homes. "Perhaps it wouldn't pass today's health and safety standards but it is a perfect fit for the Elements exhibition. 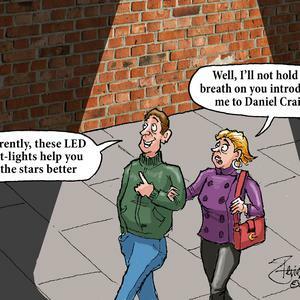 "And, on the eve of the Northern Ireland Science Festival, timing for this new addition couldn't be better." Since opening last year, the Elements exhibition has proved popular with visitors. It is based on the periodic table and explores how around 90 natural elements, including carbon and hydrogen, make up everything that we can see and feel around us - and on into the universe.